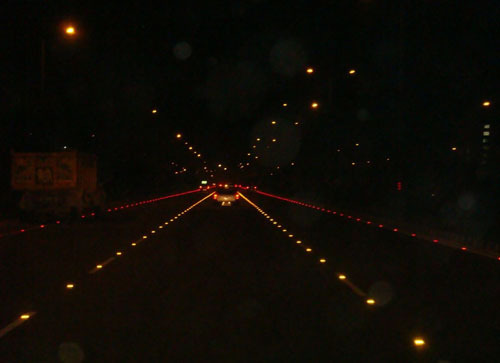 The Central Road Research Institute (CRRI) conducted a Road Safety Audit (RSA) in March, 2013, aimed at mitigating the rising road crashes on the Noida – Greater NOIDA Expressway, as well as for suggesting appropriate aesthetic and safety improvements to the central verge of the carriageway. 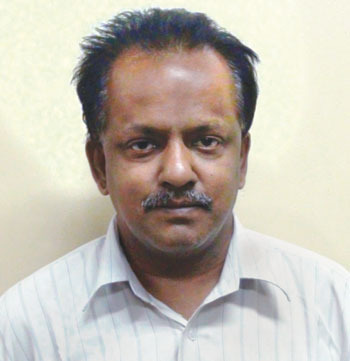 The author gives the details of the study which was sponsored by the New Okhla Industrial Development Authority (NOIDA) through exhaustive traffic surveys, collection of road crash data from various police stations and identifying existing deficiencies on the study stretch based on the RSA studies with specific focus on the Central Verge. 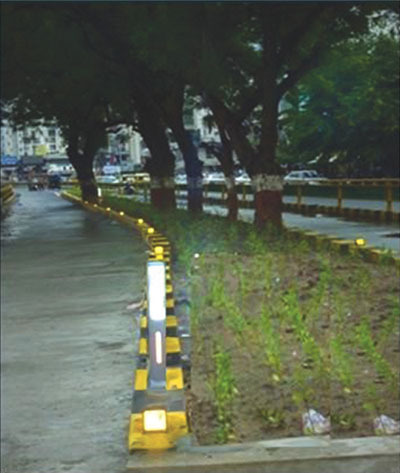 24-hour Classified Traffic Volume Studies was carried out at two selected strategic locations near Mahamaya Flyover and near the end of the expressway to cover both directions of travel. The daily traffic observed at Mahamaya Flyover towards Pari Chowk direction was 44,440 vehicles (49,556 PCUs) and 49,913 vehicles (53,397 PCUs) in the direction of Pari Chowk to Mahamaya Flyover. The traffic volume observed at Bus Stop No.8 in the direction of Mahamaya to Pari Chowk is 33240 vehicles (37169 PCUs) and the total volume observed in the opposite direction i.e. 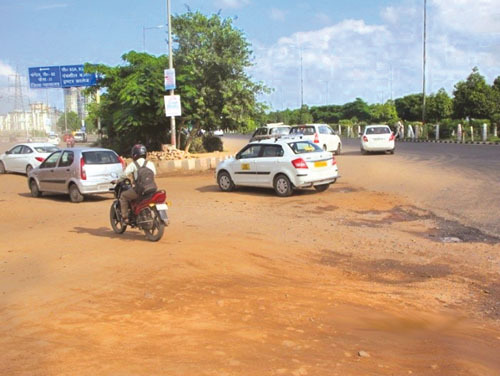 Pari Chowk to Mahamaya Flyover at Bus Stop No. 9 is 32369 vehicles (36111 PCUs). Pedestrian crossing surveys were conducted at bus stops and near HCL. The number of pedestrians crossing expressways varied between 3 – 22 during the peak hours, but near HCL, it was about 75 persons per hour. A Speed and Delay survey was carried on main carriageway as well as service road covering both directions of travel. 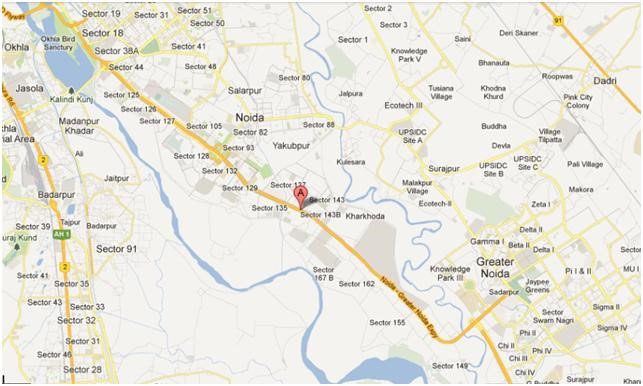 The average journey speed observed on the service road was 52.7kmph whereas the running speed was 55.8kmph. The average journey speed on the main expressway from Pari Chowk to Mahamaya flyover direction was 61.4kmph whereas the running speed was 63.7kmph. The road crash data collected from First Information Reports (FIRs) during the past five years (i.e. 2008 to 2012) was analysed. During this year, it was reported that 51 persons were killed and 42 persons were injured and the fatal road crashes rates (pegged at 64.2%) were more on expressways. Cars were the the primary vehicles in causing road crashes (31.3%), while LCV (20.9%) and Trucks (10.4%) were the other vehicles. Vulnerable Road Users (VRUs) have been two wheelers (34.3%) and pedestrians (28.4%). 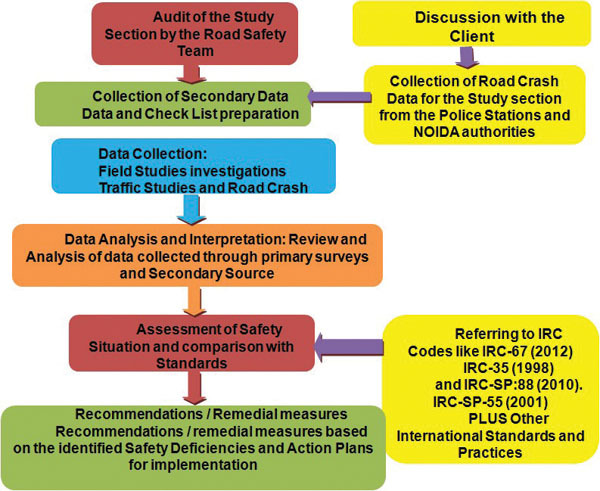 Road Safety Audit (RSA) is defined as the systematic checking of the safety aspects of new/existing project road and traffic management schemes, including modifications to existing layouts. 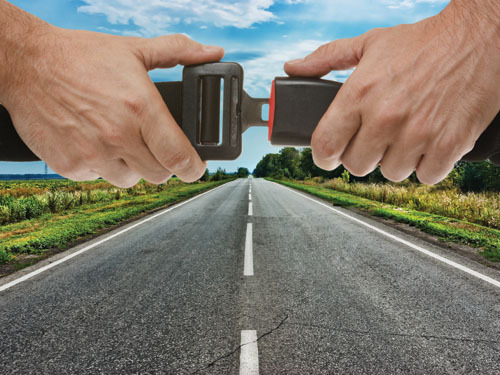 The principle aim of RSA is to ensure that road schemes operate as safely as practicable right from the beginning and also further help in reducing future safety issues commensurate with the increasing traffic. Obviously, the RSA for the study stretch (which is an existing road since the year 2001) was carried conforming to IRC-SP: 88 and also referring to other IRC literature as well as from elsewhere. The conceived methodology for this study is presented in Figure 2. Based on the audit of the study stretch, three pronged strategic safety measures have been recommended (Figures 3 – 5) for immediate implementation on the median portion of the study stretch aimed to enhancing safety as well as aesthetics and ambience. Moreover, it is recommended for the immediate removal of the Barbed Wired Fencing fortified with Guardrails on both sides of the median (Figure 6). These Concrete Guard Rails after affixing retro -reflective tapes were recommended to be placed at an interval of 25m on the service road provided on the LHS and RHS of the main carriageway. It has been recommended to provide auxiliary lanes at all merging or diverging points wherein the access to the service road is provided with the main expressway (one such location referred in Figure 7). 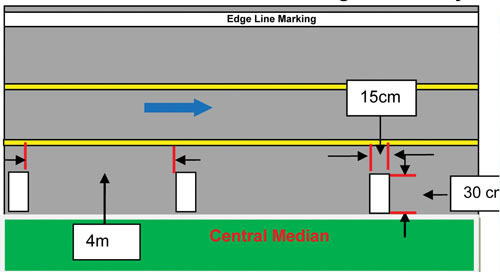 Edge line, lane markings and median edge markings will be implemented as suggested in Figure 8 coupled with placement of retro-reflective studs which will improve both safety and aesthetics of the highway. Moreover, it is recommended to replace the sign depicting ?Service Road? with ?Access to Service Road? (written in Hindi/English). Due to the ongoing intense land use developments along the expressway, huge volume of future traffic is expected to use the existing service road which is of 5.5m width on to the expressway. Therefore, it is recommended to expand the service road width to 7.5m along with the provision of 1.5m paved shoulder on either side. This recommendation falls under ?highly desirable? category. The cost towards the expansion of the service road can be recovered by the authorities from these developers as they are the direct beneficiaries. In addition, there is an urgent need to implement different types of ITS solutions by installing speed enforcement cameras on the ground, coupled with stiff fines, to curb the speed of the vehicles on the expressway, especially during lean periods of traffic flow which can directly help in enhancing road safety. There is a need for monitoring the traffic flow through the installation of CCTV cameras coupled with Variable Message Sign (VMS) boards which can help in monitoring traffic congestion and communication to the road users on the traffic situation. The above measures are classified under ?highly desirable? category for the future, considering the projected traffic on the expressway. 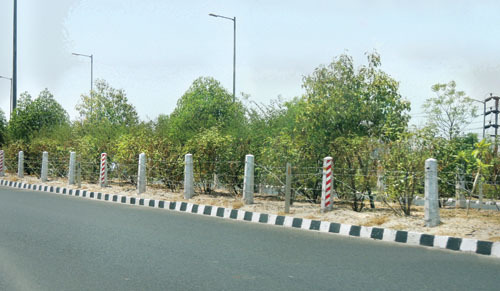 Based on the RSA conducted on the Noida – Greater Noida urban expressway, necessary improvements to the road corridor have been suggested for implementation. These recommendations have been finalized after two consultative closure meetings held with NOIDA authorities. Finally, it was also reiterated to Chairman, NOIDA Authority during the presentation made on 4th September, 2013 that without the complete implementation of the agreed RSA recommendations, this expressway would lose its sheen and the name ?expressway? attached with this highway would be a misnomer. This is because this urban arterial road is expected to attract huge quantum of traffic in the foreseeable future, from Yamuna Expressway, Greater Noida and adjoining institutional and residential developments along this expressway itself (emerging on the Service Road). Previous: Are India’s popular small cars unsafe?